In a large cup, stir the 1/4 teaspoon of vanilla into the milk. Soak the cinnamon sticks in the milk overnight. 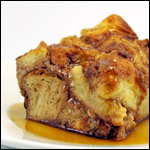 When ready to prepare, remove the cinnamon sticks and beat the eggs with the milk mixture. Add a drop more of vanilla extract to the mix and mix well. Transfer to a large shallow bowl or pan. Place a large skillet over medium heat. Coat the bottom of the pan with one Tablespoon of butter or vegetable oil (per batch). 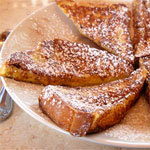 Soak each slice of brioche bread in the egg and milk mixture for about 1 minute until thoroughly coated and soaked. Using a spatula or large slotted spoon, transfer the bread to the hot skillet. Note: If you don't want to mess with the cinnamon sticks and soaking overnight, just beat the eggs and milk with the vanilla and 1/2 teaspoon of regular cinnamon. 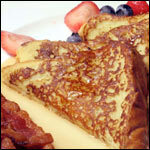 Brioche is a rich and tender bread that makes excellent French Toast. Serve warm with maple syrup or powdered sugar. 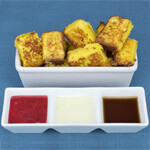 What do you think of Brioche French Toast?